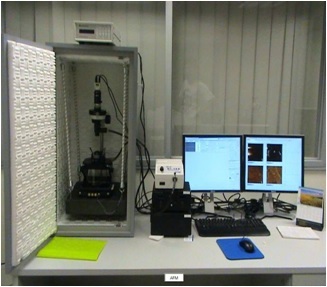 Scanning Probe Microscopy (SPM) is a large and growing collection of techniques for investigating the properties of a sample, at or near the sample surface. The SPM instrument has a sharp probe (with radius of curvature typically in the nanometers or tens of nanometers) that is in near-contact, intermittent contact, or perpetual contact with the sample surface. Widely-adopted SPM technique was Scanning Tunneling Microscopy (STM). In STM, a bias voltage is applied between a sharp, conducting tip and the sample. When the tip approaches the sample, electrons “tunnel” through the narrow gap, either from the sample to the tip or vice versa, depending on the bias voltage. Changes of only 0.1nm in the separation distance cause an order of magnitude difference in the tunneling current, giving STM remarkably high precision.